Looking for a Used Sorento in your area? CarGurus has 37,072 nationwide Sorento listings starting at $1,500. Though a heavy right foot often precludes me from enjoying fuel economy on par with the EPA estimates, my Sorento actually over-delivered with 24.2 mpg on a long highway run. The fires of the crossover segment continue to be stoked by all-new, completely reimagined, and strategically updated models. The 2014 Kia Sorento falls into the latter category, and while it earns points for style, performance, safety and substance, a general lack of comfort may prove to be a deciding factor for potential buyers. Once heavily dependent upon styling cues borrowed from other manufacturers, Kia has gradually developed its own identity, with guidance coming from a chief designer hired away from Volkswagen. Today, models like the 2014 Sorento can be confused with premium-branded rides from Lexus and Acura not due to mimicked visual cues, but rather because of elements such as LED taillights and front marker lights, attractive standard alloy wheels and a host of other features that may raise the eyebrows of those who have long considered Kia little more than an entry-level marque accented by a 10-year/100,000-mile powertrain warranty. Updated for 2014, the Sorento now sports a revised front end with a new bumper and slightly reworked headlights, a new V6 and more powerful standard 4-cylinder engine, a height-adjustable power liftgate, an available blind-spot monitoring system and an electric power steering setup engineered to improve efficiency. Unfortunately, though not surprisingly, those items are not among the equipment found on the base, front-wheel-drive Sorento LX (all-wheel drive is optional for all Sorentos). Starting at $24,950, including an $850 destination charge, this model features the 4-cylinder engine, 17-inch alloy wheels, heated mirrors with integrated LED turn signals, satellite radio, Bluetooth connectivity and a tilt-telescoping steering wheel with integrated audio controls. An LX V6 variant is also on the menu, as is an EX V6 fitted with 18-inch alloys, automatic headlights, fog lights, dual-zone automatic climate control, Kia’s UVO infotainment system, leather upholstery and trim, triple-setting heated front seats, push-button ignition and several other desirable amenities. Next in line is the SX trim level, differentiated from the EX V6 courtesy of its 19-inch alloy wheels, color-keyed lower body kit, unique grille, massive panoramic sunroof, navigation system with an 8-inch screen, 10-speaker Infinity audio upgrade, blind-spot monitor, power liftgate and front seats that can be heated or cooled. Positioned atop the lineup is the SX-L, or Limited, which adds HID headlights, a leather-and-wood-trimmed heated steering wheel, premium leather hides on the seats and heated second-row seats. A loaded Limited model will set you back $42,150. For this evaluation, I test drove a 2014 Kia Sorento SX equipped with all-wheel drive ($1,800) and a third-row seat ($1,200) that bumped seating capacity from 5 to 7 passengers. With the $850 destination charge factored in, the sticker price came to $38,850. A couple of notable changes have been made under the Sorento’s hood for 2014, one of which was the discontinuation of the base multi-port fuel-injected, 2.4-liter 4-cylinder engine that delivered 175 horsepower and 169 lb-ft of torque. 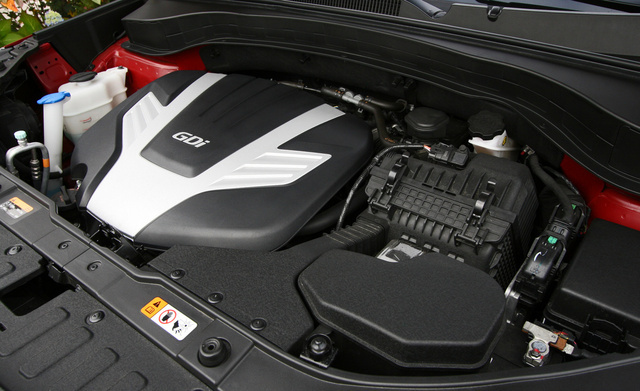 The LX’s new standard mill, available as an upgrade in 2013, is a gasoline direct-injected (GDI) version of that same powerplant, one that’s good for 191 horses and 181 lb-ft of torque. A 6-speed automatic transmission with a manual shift mode is standard in all Sorentos. EPA-rated fuel economy for a front-drive 2014 LX is 20 mpg city/26 highway/22 combined. Drivers who want a bit more kick in their step—as well as the ability to tow up to 3,500 pounds, or 1,850 pounds more than the LX—will want to opt for the available 3.3-liter GDI V6 that unleashes 290 eager ponies and 252 lb-ft of torque. This engine replaces 2013’s 3.5-liter six-shooter, good for 276 horsepower and 248 lb-ft of torque. In front-wheel-drive guise, the new V6 earns EPA ratings of 18/25/21 mpg, down just a smidge from last year despite the sizable bump in output. Models like my all-wheel-drive SX test car are expected to average about 18 mpg in town and 24 mpg on the highway. Though a heavy right foot often precludes me from enjoying fuel economy on par with the EPA estimates, my Sorento actually over-delivered with 24.2 mpg on a long highway run (some credit goes to a driver-activated Active Eco feature that forces the powertrain and climate-control system to operate in the most efficient manner possible). Granted, that’s not exactly mind-blowing efficiency, but it is commendable when you remember that it’s tied to a V6 offering an abundance of muscle, allowing for seamless and effortless merges into quick-moving highway traffic. And, for those times when you need to slide over into the Autobahn-esque passing lane, a good goosing of the throttle will unload the Sorento V6’s reserves and have you cruising amongst the pack in no time. 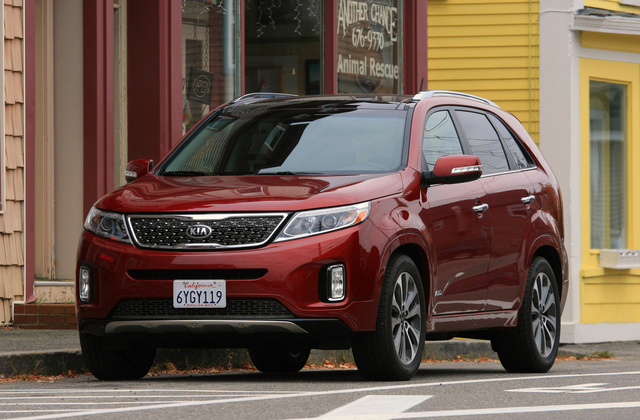 Around town, the Sorento was equally pleasing to work with, though an overly sensitive gas pedal did take some getting used to; applying slight pressure, especially when starting from a stop or creeping along in rush-hour congestion, remedied the problem. The 6-speed automatic transmission required no such finesse, as it delivered smooth shifts regardless of whether I was tooling around town or jockeying for position on I93 at 4PM, just one of thousands trying to get through the city of Boston before time clocks were punched and miles of roadway transformed into slowly migrating parking lots. I was even able to inject a bit of fun into this 4-wheeled escape thanks to the aforementioned manual mode (click the gear level to the left, tap forward for an upshift and rearward for a downshift). Chances are few owners will utilize this feature, but it adds a degree of interaction some drivers may enjoy. And, in a more practical sense, it can prove beneficial when towing by holding the transmission in a specific gear—preventing an unwelcome and ill-timed upshift when pulling a load up a hill, for instance. FlexSteer is another tool Kia employs to enhance the driving experience. Standard and available only in SX and Limited models, this feature provides 3 modes: Normal, Comfort and Sport. The first two settings are well suited for slow city driving, as they’re tuned to require very little steering effort. However, at highway speeds, Normal and Comfort were too light for my liking, requiring frequent input/correction and delivering negligible amounts of road feel. The Sport mode, on the other hand, tightened things up and provided the responsiveness that had been lacking. No, not sports-car precision, but the steering felt hefty and reacted more predictably, and a few spirited outings on local back roads were far more rewarding. Those excursions unveiled a suspension setup that’s firm yet not stiff or jarring. It probably doesn’t come as a shocker to learn that I used the Sport mode most often and had a good bit of fun with the Sorento as a result. Comfort, as it turns out, is not the 2014 Kia Sorento’s strong point. On short drives, I was perfectly content thanks to my SX’s power driver’s seat (including lumbar), manual tilt-and-telescoping steering wheel wrapped in soft leather, padded armrests on the door and between the seats, sufficient side bolsters and leg support, and headrests that were large and adjustable. Those good points lost their luster when I was behind the wheel for longer stints. During one 200-mile trip, for example, the lower seat cushion had a nasty habit of nagging pressure points on my thighs. Unfortunately, no amount of adjusting did the trick. As an added detraction, the driver’s seat didn’t slide back as far as I would’ve expected; even with my short legs, I could easily reach the pedals, so taller individuals might find space to be lacking. Second-row passengers have their own collection of pros and cons to deal with. To its credit, the 2014 Sorento’s middle bench offers reclining seatbacks, ample head and foot room, a fold-down center armrest with cupholders and niceties including pillar-mounted air vents and a handy 115-volt outlet for charging items such as a portable DVD player. But those pluses are countered by a stiff and uncomfortable center seat section and, again, a dearth of leg room. With the front seat adjusted for my 5’8” frame, and the second row slid to its rearmost position, my knees cleared the hard plastic backing of the front seat by only an inch or two. Again, passengers who have been more vertically blessed than myself may want to keep that in mind. That brings us to the third row. To be fair, few crossovers or SUVs have made this modern-day mother-in-law seat truly hospitable, and my 2014 Sorento SX tester was no exception. The area was cramped, and really suitable only for small kids, or larger people in a pinch. Foot room was sufficient, leg room was pretty much non-existent and the lack of head room was undoubtedly responsible for sacrificing a few more of the sacred hairs on my balding noggin. At least the lower cushions were softer than most. Accessing the third row is facilitated by a lever that tilts and slides the passenger-side section of the second-row seat forward. Both sides can be folded nearly flat to increase cargo-carrying capacity, but some may find the relatively heavy seatbacks difficult to return to their upright positions, and you’ll likely need to move the front buckets to clear the headrests. 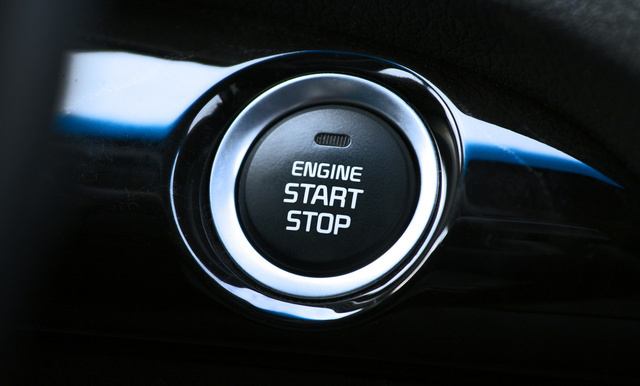 Other companies, such as Nissan, get this all done in a simpler and more user-friendly fashion. Aside from the seats, my Sorento SX’s interior was home to mesh fabric on the headliner and visors, leather upholstery that felt thick and not the least bit supple, and an abundance of hard plastics that, while not the soft-touch materials one might prefer, at least offered a matte/low-gloss finish. Most of the primary dials and buttons are also molded out of hard plastic and are without rubber grips that lend a more premium feel, yet all felt solid and durable. The thin bit of leather covering the top of the gauges is reminiscent of luxury-branded models and is standard in SX and Limited trims. 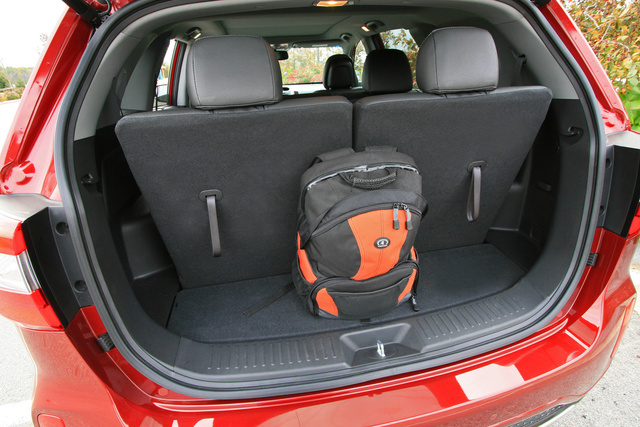 With a nod to its crossover versatility, the 2014 Sorento features a multitude of cupholders, cubbies and storage compartments, including one under the trunk floor. For occasions that call for hauling cargo rather than passengers, this Kia offers up to 72.5 cubic feet of space with the second- and third-row seats folded. Like a growing number of competitors, Kia offers the 2014 Sorento with a smartphone-linked infotainment and navigation system. Known as UVO eServices, drivers can use the feature to locate their vehicle, call for emergency assistance, take advantage of various vehicle diagnostic tools, upload destinations from their Bluetooth-enabled iPhone or Android device using Google Maps and manage music from multiple sources. Once configured, the technology is easy to use with voice controls and an 8-inch touchscreen that’s appropriately sensitive to the light tap of a finger and includes intuitively labeled icons. For shoppers pondering the purchase of a new crossover, the goal is not simply to find a rig that will haul up to 3 rows of passengers—it’s to find a rig that will do so safely. The 2014 Kia Sorento answers the call with a Top Safety Pick award from the Insurance Institute for Highway Safety (IIHS) and an overall 5-out-of-5-star rating from the National Highway Traffic Safety Administration (NHTSA). In its effort to protect occupants from harm, Kia equips all Sorentos with 6 airbags, front active headrests, 4-wheel antilock disc brakes, electronic stability control and more. A rear-view camera is standard in all but LX trims. Those of you who have spent any time researching the current crop of family-friendly crossovers know the playing field is chock full of competitors, many of which have been redesigned to offer more room, greater efficiency, the latest and greatest creature comforts and connectivity-related technology, and what each automaker claims to be the epitome of aesthetically pleasing functionality. To get a sense of how the 2014 Kia Sorento SX measures up, I compared it to all-wheel-drive versions of the 2014 Honda Pilot EX-L with Navigation, the 2014 Nissan Pathfinder SL and the 2014 Mazda CX-9 Grand Touring. All models carry a base price of roughly $37,500, with the exception of the Honda, which tacks on an extra $2,000. In terms of strengths, the Sorento leads this particular pack with the longest basic warranty (5 years or 60,000 miles for the Kia, 3 years or 36,000 miles for the others) and the only 10-year/100,000-mile powertrain warranty, while it proves competitive with its 5-year residual value, average J.D. Power and Associates’ initial quality and predicted reliability rankings (only the Nissan ranks below average) and comparable V6 fuel economy. Interestingly, the 290-horsepower Sorento is more efficient than the 273-horsepower Mazda CX-9; credit for this accomplishment can be attributed, at least in part, to the former’s direct-injection engine technology and a curb weight that’s hundreds of pounds less than not only the Mazda, but also the Honda and Nissan models. 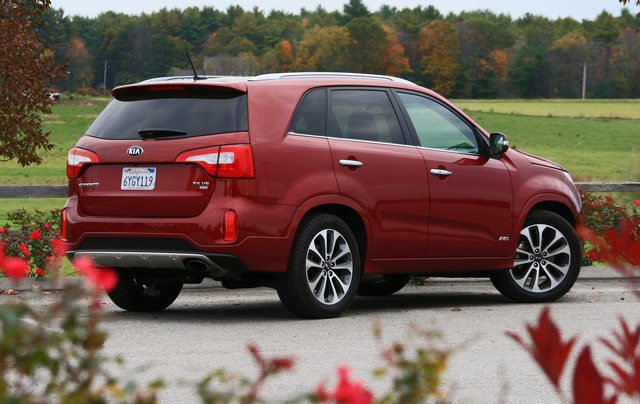 Shifting our focus to relative weaknesses, the 2014 Sorento fails to deliver the best fuel economy or engine torque. Perhaps equally important to buyers focused on versatility and capability, the Sorento’s 3,500-pound towing capacity is outmatched by the Honda (4,500 pounds) and the Nissan (5,000 pounds), and its maximum cargo volume is significantly less than the others. Thom is a lifelong car nut, owning cars ranging from Datsuns to Mustang GTs and, currently, a Hemi-powered Ram 1500. He has spent the past 15 years writing objective, thorough vehicle reviews and consumer-focused feature articles for Autobytel.com, Kelley Blue Book, The Boston Globe, Cars.com, and other leading websites and publications. 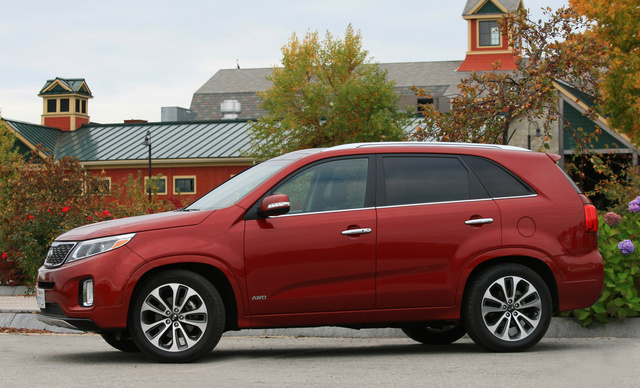 What's your take on the 2014 Kia Sorento? Users ranked 2014 Kia Sorento against other cars which they drove/owned. Each ranking was based on 9 categories. Here is the summary of top rankings. 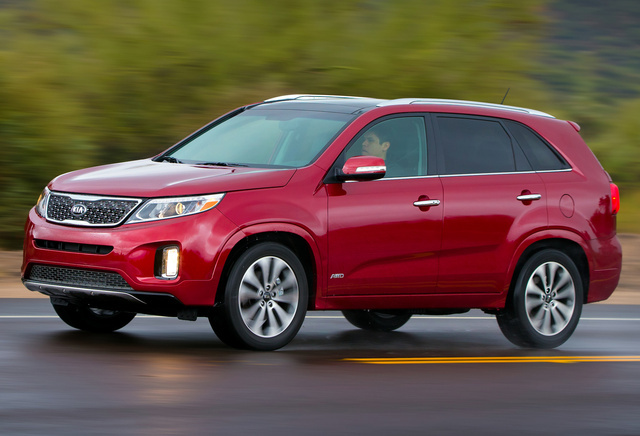 Have you driven a 2014 Kia Sorento?